The word canyon comes from the French while the word gorge comes from the Spanish. They both refer to the same thing. Nowadays, the Spanish word for canyon is barranco. A barranco is a valley with exceptionally steep walls, usually carved by a river that may or may not still be in evidence. Canyons are always formed by erosion over a very long period of time, climate and weather. Their formation starts by faults, or "cracks in the earth". This causes a rise of the surface by geological pressure from inside the earth. 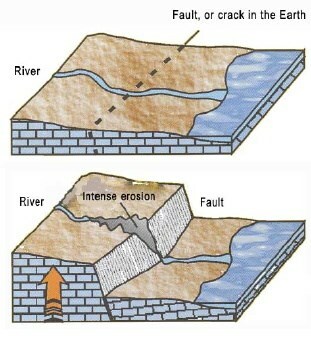 Then the fault is breaking, due to the geological uplift and pressure. A gorge is beginning to be formed. Immediately, a river will finds its way through the gorge and in its bed the river causes immense erosion. There are huge canyons like the Grand Canyon in Arizona, the Fish River Canyon in Namibia and the Blyde River Canyon in South Africa. In Europe, we have smaller canyons like the Verdon Gorge in France and the Samariá Gorge on Crete. 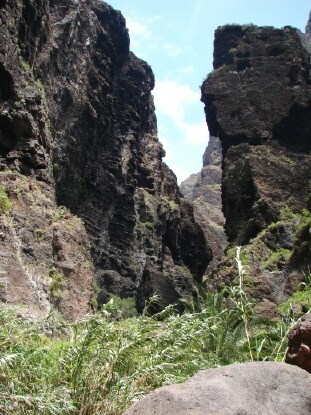 On Tenerife, there is a small, but very beautiful gorge, the Barranco de Masca. The gorge is located in the Especio Natural Protegido. 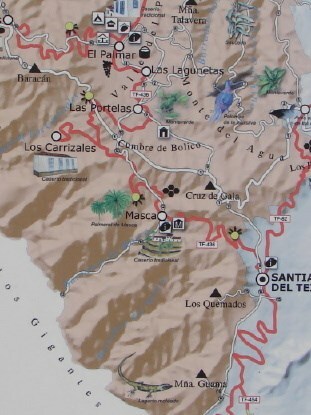 Starting at a height of 600 m in the small village Masca, it runs down in about 4 km to sea level at the Playa de Masca. During the mild seasons, there is fresh running water in the Barranco. Exotic plants could therefore be found throughout the entire canyon. The first part of the Barranco runs through terraces and is rather wide but very steep. It ends at a small footbridge where the footpath crosses a small river. Then the Barranco narrows. The footpath follows the river and leads along pools and small waterfalls in the river. In the most narrow part of the canyon, the rock walls are extremely sheer, or even overhanging. 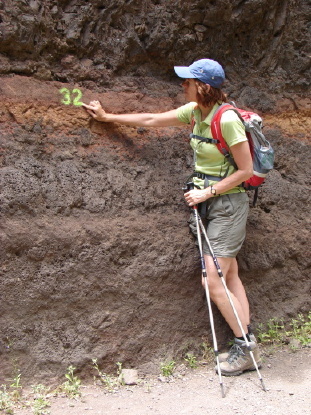 One of the tasks for you is to estimate the minimal width of the canyon. Walking further downwards you will eventually end up at a small beach, the Playa de Masca. A boat can bring you back to civilization or you can climb up the 600 m back to Masca. In order to log this cache, you have to fulfill a couple of requirements. It would be nice if you could tell us in your log, whether you found fresh running water in the Barranco.